Top made the fresh fruit crostata, start with making the short crust pastry. Cut the vanilla seeds with a knife and remove interior matter, then put in a mixer with the flour, sugar, and cubed cold butter. Run the mixer until everything is the consistency of fine sand, then add the egg yolks and mix again until small clumps form, then put the mixture on a kneading board and knead rapidly until the mixture is homogeneous, shaping into a small loaf. Wrap it in food film and put in refrigerator for at least 30 minutes. In the meantime, make the custard. Pour into a small pan the milk and the lemon peel, bring it almost to a boil, remove from heat and let cool; in this way, the lemon peel will remain in the milk and will aromatize it. Remove the lemon peel, add the sugar and yolks. Whisk energetically and add the sifted corn-flour, then put back on the heat, cooking until the custard is dense, stirring constantly. Pour the custard into a wide, low container, cover with food film and let completely cool at room temperature, then place in refrigerator to harden. In the meantime, spread out the short crust dough on a lightly-floured kneading board and cut out a circle some 4mm thick; using a rolling pin, lift up the circle of dough and place on a 24cm circular pie baking pan. Ensure that the dough completely covers the interior of the pan, and trim off any excess along the top. Prick the bottom with a fork so that no bubbles will form during baking. Bake the shell now, without filling: cover the dough with a circle of baking paper, then place on top of it some ceramic balls (or dried chickpeas), which will hold down the crust during the baking. Bake in a pre-heated conventional oven at 180°C for about 20 minutes (for a convection oven, 160° for about 15 minutes); the crust should bake without too much browning. When done, take the crust from the oven, remove the balls (or whatever you have used), and bake for an additional 5 minutes, until it is well-browned and the bottom is dry. Remove and let cool on a rack. The custard will now be cool; beat it with a hand mixer for a couple of minutes to give it a velvety consistency. Put it in a disposable (or fabric) pastry bag and cover crust bottom with custard, then spread it smooth with a spatula. Now make a covering for the fruit, so that it will not oxidize and to give it a nice gloss. Put the preserves with some water in a pan and bring to a boil, then lower the heat and let simmer for 2 minutes, then put it through a sieve to make smooth, and let cool. In the meantime, carefully wash all the fruit, cut the oranges into slices, peel and slice the kiwi, and finally the strawberries and the banana. 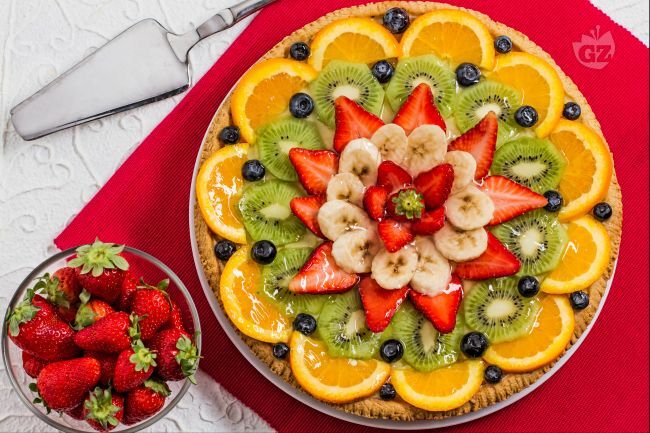 Arrange the fruit slices in a ray pattern, arranging the orange slices first and then the kiwi, completing the arrangement with the strawberries, bananas and blueberries any way you wish. With a pastry brush, spread the fruit gelatine over the crostata, then put in the refrigerator for at least 2 hours before serving.